North American energy firm TransCanada Corp has revealed that it has decided to proceed with a $12 billion plan to begin transporting large quantities of oil from the west of Canada to the country’s east coast. The project, which involves constructing a lengthy new conduit, dubbed the Energy East pipeline, is the largest ever undertaken by the company and has been lauded by politicians, interest groups and industry professionals throughout the country. TransCanada, based in Calgary, hopes to deliver 1.1 million barrels per day through its new pipeline. It hopes to begin supplying terminals in Quebec in 2017 and New Brunswick a year after. The oil will be pumped from receipt points in Alberta and Saskatchewan. Of the 1.1 million bpd that will be produced, 900 million are secured by long-term, binding commitments the company has already entered into with shippers. Although 3,000km of the pipeline to be used is already underground, a further 1,400km of new pipes will need to be laid through Quebec, Alberta, Saskatchewan, and Manitoba. The 3,000km already underground is currently used for gas transportation and will need to be converted. Although the project is yet to receive full regulatory approval, it has been given the thumbs up by two provincial governments – New Brunswick and Alberta – and is hoping to secure the blessing of a third – Quebec – in the near future. It will also be subject to an environmental review. 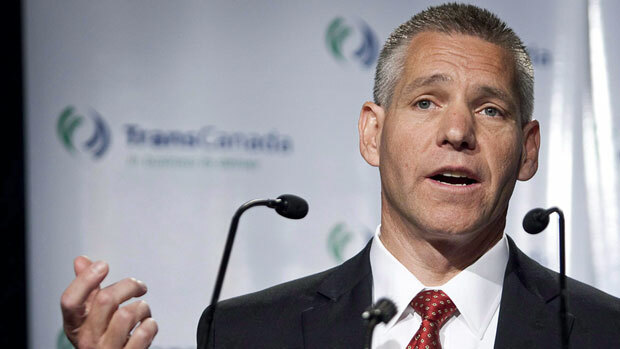 TransCanada chief executive Russ Girling likened the project to the Canadian Pacific Railway and the Trans-Canada Highway, ambitious ventures which in their time delivered new economic opportunities to millions of Canadians. “This is a historic day for TransCanada and a historic day for our country,” he said. TransCanada’s announcement was welcomed by Canadian Natural Resources Minister Joe Oliver, who said that the new pipeline will mean a better deal for refiners and will provide a way for the country to reduce its reliance on foreign imports. Alberta finance minister Doug Horner also commented on the news, saying that the pipeline will have a “huge” impact throughout his province. “The impact is going to be huge because obviously if you can move a million barrels per day to the eastern seaboard and get additional markets that perhaps we weren’t looking at getting into as quickly as this, that’s going to have a pretty significant impact on investment decisions for Alberta,” he explained. The pipeline also has its detractors. Despite receiving ringing endorsements from public officials, some critics are sceptical about whether the project can deliver the energy security and job creation its backers promise. Similar worries have already led to the delay of another project, linking pipelines in Canada with one further south in the United States. The Keystone pipeline, which could pipe 300,000 bpd between the two markets, has been awaiting US State Department clearance for several years. President Obama is expected to make a definitive decision sometime later this year. As well as announcing that it’s green lighting the development of the pipeline, TransCanada also announced that will partner with Irving Oil in building a new export terminal near Saint John, New Brunswick. The company announced that the new terminal’s capacity will be 30 per cent greater than it had originally planned after receiving greater-than-expected interest from shippers.